Returning to live in Nigeria after nearly a decade away, the influence of another culture makes me observe life through a different set of lenses. Like a black face in a sea of white faces, our national pastime immediately stood out to me. In the past, this hobby did not elicit a raised eyebrow from me since it blends seamlessly with the landscape. On the streets, behind magnificent edifices, under bridges, at the corner of dream castles, and even in front of crude, hand-painted signs that expressly forbid it, men and women, boys and girls, and goats and dogs all rollick in this pastime. I dare say that you or someone you know has been involved in it. Being a showy people, we engage in this activity openly, without shame, and no thought of decorum. Have you guessed what it is? No, it is not football; it is urinating in public! Urine pours like libation all across the land and there is no hallowed ground. Any gutter, wall, bush, or piece of land will do. Smart-looking men disembark tinted-glass Lexus jeeps mid-street to relieve themselves beside school-aged boys turned vendors. Women, though in the minority, refuse to be outdone. Whether standing astride, or crouching low with bunched-up skirts, they contribute their quota to this swelling, smelling river that threatens to overflow its banks. Are people in such dire need that they cannot wait until they get to a toilet? Does a dearth of facilities fuel this activity? I observed a security guard having a go on a neighbour’s fence, so I made enquiries about the gatehouse in front of the estate where he worked. There was a toilet and yes, there was running water. Pray tell, what should I conclude? That old habits die-hard? That the satisfaction derived from relieving oneself in the open is out of proportion to that obtained in the confines of a cubicle? That borderline exhibitionism is pervasive? That, that … the, Do Not Urinate Here By Order-sign, which stands at attention in front of the fence, is an open invitation to do so? All this has given me a new perspective on handshaking. Fortunately or maybe unfortunately, hugs are more commonplace in my setting. Friends, however, remind me that worse things have not yet killed a man. 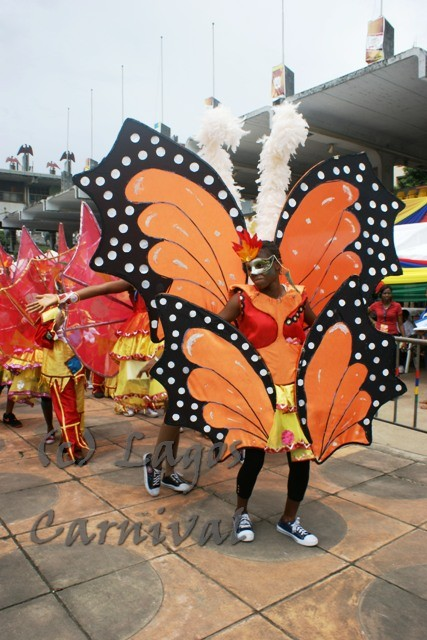 Sometime ago, my family and I were caught in traffic occasioned by the Lagos Carnival, for several hours. We missed the warnings about roadblocks thanks to our habit of predominantly watching foreign TV channels. Anyway, we killed time by enjoying a hot but decent view from a bridge on Lagos Island. The heat from the sun was momentarily diverted to my brain when my son asked to use the toilet. I calmly explained that there were no nearby facilities all the while crossing my fingers. After trying to contain his distress for a few moments, he approached me again and again and again. With no alternative in sight, I got off my high horse and encouraged him to just do it on the kerb by the bridge. Reminding me of my stand, he vehemently protested. Nature won the battle eventually, and I escorted him to a less conspicuous corner while eating my humble pie. Title: Project Nigeria : Day 2 : The Law. When ya gotta go you gotta go. Hahha! Very funny post! I don’t think there is a thing I can say about this without getting myself in serious trouble. So better leave it alone! I had a good laugh reading this. And you totally fooled me into thinking our favorite pastime is ‘good ol football’ , add spitting indiscriminately and dumbing of food wrappers anywhere but a trash can to the mix and you have a Nigerian salad. But this really isn’t a Nigerian problem alone, it cuts across races and cultures even though some are more public pissers than others. You’re right, humanity is cut from the same cloth- a drunk man will pee anywhere. But as a culture, it is less socially acceptable in some places than others. Can Nigerians frown on this and change the culture? It isn’t doing us any favours. Hahaaa.. humble pie.. its cheaper doing it by the kerb than searching for a legal place or begging the gatekeeper of an eatery to allow usage of their facility. 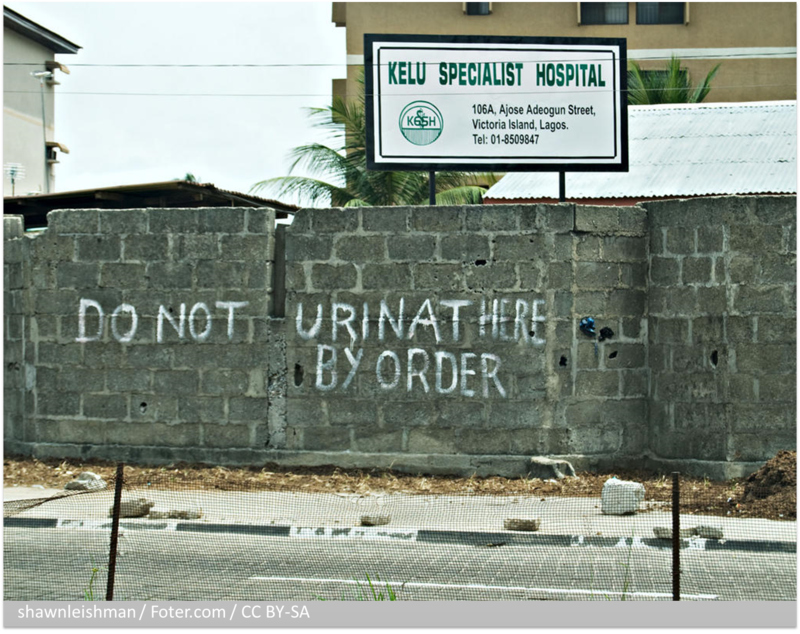 Then you also forgot – do not urinate here. Penalty #5000 by order.. The story with your son is just so coooote…I didn’t know we had a urination epidemic at home, that extended to women whipping ‘it’ out. Some of my girlfriends do that over here now and again and I always thought, ‘Ah…just one of those oibo wild n crazy things…’ I’m all about that Fence Warning and would love to see such a message on a wall in the UK: DO NOT URINATE HERE BY ORDER OF THE QUEEN. Seriously, I think you only need to drive a few kilometres or walk down a street to see someone in ‘action’. I definitely could relate to this when I read it. What about you? What do you think of our National pastime. I had a good laugh…..
Urine pours like libation all across the land and there is no hallowed ground….. Women, though in the minority, refuse to be outdone….they contribute their quota to this swelling, smelling river that threatens to overflow its banks. More worrying is that we all really have come to accept it as the norm because that’s all we know. Never mind! E go better, abi God dey! Sadly enough, that’s the norm here 😦 If you are a stranger to an area and unfortunately find yourself in dire need of a pee, or worse, to “dung” (as some folks call it), the people around/ inhabitants will simply point you to any corner they feel is secluded. To ask for the nearest restroom is like mentioning something out of this world. Erecting public restrooms will be a step in the right direction. But then, how many of our leaders are willing to replicate what they see in the west? I really like your blog–the layout is fantastic. Many thanks for commenting on my story. Uzoma, yes restrooms would discourage this behaviour. Although, I recall seeing some public restrooms in Lagos, but … We also need a re-orientation, otherwise people will pee outside the restrooms like the security guard I observed! Someone did mention that since running water was scarce, people didn’t want to waste water flushing pee… so we’re back to infrastructure again! Thanks for the compliment on my blog. You write engaging stories, I enjoyed reading them. Yes o. Re-orientation — that’s the keyword. How did I forget that in the first place? If such facility and more are put in place without sensitizing the people about good hygiene, all efforts will be come to waste soon afterwards. “Someone did mention that since running water was scarce, people didn’t want to waste water flushing pee… so we’re back to infrastructure again!” My sister, that’s a big challenge not even in Nigeria alone. I still hold our public office holders accountable. Are they there to be served or to serve? How about the people who actually use restrooms but do not wash afterwards? How reprehensible (I dey learn new word ni o! hehehe) is that? Yaba used to be sight for such things. I mean, you would see people, both male and female line up and avail themselves of any spot available! But since Fashola cleaned it up, it’s drastically reduced! How did he do it? He cleaned up the road and planted flowers! I mean, any normal thinking person would think twice before anointing innocent flowers with some urich acid na – abi? I agree that it’s a wrong mentality. Urinating in public has become so much a part of us that we don’t stop to think about what we are doing. People that don’t wash their hands after using restrooms… hmmm you know the people who urinate in public don’t wash their hands either! That’s why handshaking became (to use your word), reprehensible to me :). Arinze, I am rolling with laughter! That’s a good one… I wish I had a photo of the signboard, then I could write another blog post :). Thank you for your compliment & for always encouraging me.